PRODUCT DESCRIPTION: Odorless growth regulator which is added to an adulticide for insect control. Although it will do nothing to adult insects, it will sterilize eggs and larva so they are unable to develop into adults. 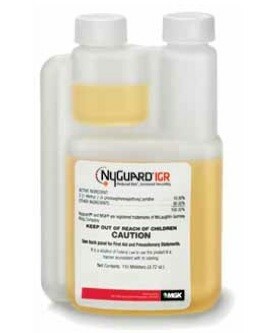 NyGuard contains a full 10% active compared to common Nylar based products like Archer and IGR which only contain 1.3% active. TARGET PESTS: Ants, Beetles, Clothes Moths, Cockroaches, Crickets, Fleas, Flies, Psocids, Silverfish, Weevils and more. See complete list on label (link below). WHERE TO USE IT: In the home on carpet, furniture, flooring and outside around the yard. RATE OF APPLICATION: 4-12 ml per gallon of water per 1500 sq/ft depending on target insect. Can I mix Nyguard with Eccentia ?